An interesting subject that in trying to �catch� for this work was like at times chasing butterflies with a net containing a large hole. Collected originally by Eugene Poilane, a French Forest Officer, it was later described by French botanist Gagnepain in 1934 from the materials submitted by Eugene Poilane. In Woodcock and Stern, 1950, L. polianei, in translating form the original Gapnepain French of the description made from the dried specimens collected by Poilane in French Indo-China (northwestern Vietnam) describes the flowers as being pale yellow with a longitudinal Turkey red line. In 1980, Patrick Synge had a similar description, working from more than likely the Gapnepain description as well said "there had been no further collections made of this species" and, �the flowers are neither blotched nor spotted�, as well as �it is not clear whether this red line is on the outside or inside of the flower. In 1980, Synge also said �as far as is known, it has never been re-collected nor has it ever been in cultivation which was true at that time, but much has changed recently. As to the accuracy of the description of dried flowers to that of the translation from French to English, questions remain as there are no photographic records of the original discovery. There is no mention of a red stripe which, as one comment says, seems to have been a figment of Gagnepaine�s imagination. Gagnepaine tranlated Poilanei's description of "red middle part" to "red median line". It is now also strongly suspected this lily could be simply an endemic form of�L. primulinum var. burmanicum. In recent years, a number of photos have been taken in the original area of collection of this species, and none match the Gagnepaine description of having a �turkey red line�. All are either �blotched� in color in the centers, or are nearly spot free. Offered here are photos of plants as found in the wild, or in the case of that of explorer Dan Hinkley, of a bulb that was wild collected and then flowered here in the US. Also included is uniquely different color form as flowered by the JC Raultson Arboretum in North Carolina. As with many lilium species, there is a wide range it would seem of color from creamy white to light yellow with nearly no spots to heavy center color. No flowers recorded in recent years match the Gagnepaine description. Title photo as well as inserts #1 and #2 are taken in habitat by Yijia Wang. Yijia located this colony of L. poilanei containing heavily colored centers to nearly spot free centers "on only one mountain on the border of Vietnam", at an altitude of about 3,200 feet ( 1000 meters). Copyright Yijia Wang, all rights reserved. Insert photos #3 and #4 taken in habitat by Nguyen Sinh Khang, Department of Plant Resources, Institute of Ecology & Biological Resources, Vietnam Academy of Science and Technology of again heavily colored blotched center as well as nearly spotless subject. Photo submitted by Martin Toon from the New Zealand Lily Society. Photo insert #5, courtesy of JC Raulston Arboretum at NC State University, provided by Andrew Pais Ph.D. Database and Plant Records Coordinator. Copyright JC Raulston Arboretum, North Carolina State University, all rights reserved. Used with permission. This photo is interesting in that it does not have the characteristic heavy "blotch" of color or just a few spots, but a light blush of color in the center further showing the range of variance within this species. Photo insert #6 of wild collected plant flowered "in captivity" by plant explorer Dan Hinkley. Photo source, web postings. 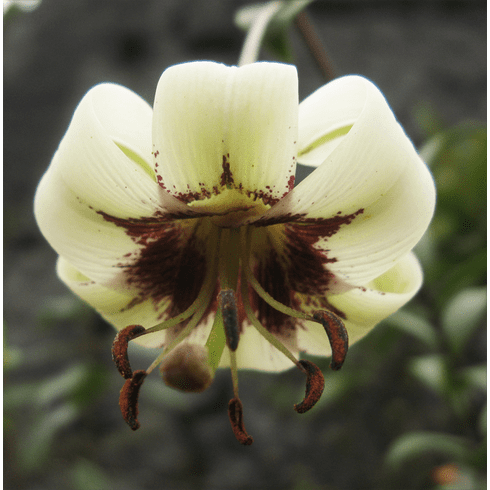 This particular flower is interesting in that it is showing the transition from the creamy white form to light yellow. Photo insert #7 courtesy Pontus Wallsten of seed grown deeper yellow form from wild collected seed. Copyright Pontus Wallsten, all rights reserved. Photo insert #8 is from Woodcock & Stern, 'Lilies of the world' (1950) page 238, Fig. #92 showing photo of the dried "Type-specimen" that was collected by Eugene Poilane. Such a dried specimen to work from may account for the discrepancy in the original description of this collection and that of what current explorers are finding now in habitat. Only further exploration will tell the final story on this lily.